Fall in the Anthem area means shorter days and extended hours for outdoor lighting. Cooler weather offers a prime opportunity to check existing security lighting for problems. Since Halloween is coming, we want our homes to be ready and all of our lights to be working, so our property is safe and well-lit for the kids, and also secure from vandals and thieves. If you decide to update your current security lighting, keep your objectives in mind. The layout of your home, the doors, windows, and gates will make a difference when you employ security lights. It's hard to hide in a dark corner when there aren't any available. Security lighting should be equipped with motion sensor devices. Thieves and vandals hate motion-sensor lights, as they can be connected to security camera activation. Cameras are difficult to see in the dark, and even more difficult if a person has a security light shining in their face. A thief doesn’t know if the security is set up to activate a Smartphone alert, but the smarter criminals won’t stick around long enough to find out. If it isn’t possible to put security lighting on motion sensors, another great option is dusk-to-dawn photocells. Solar lights are a third option. Each situation is unique. Security lighting has to adhere to the HOA rules and also be respectful of the neighbors, who don’t want anyone’s security lighting glaring balefully into their windows at every turn. One thing we should mention here is layered lighting. Layering your lighting will achieve a few different results at the same time. One of the things layering lights provides is an extra measure of security. It’s hard to hide in a dark corner if there aren’t any available. 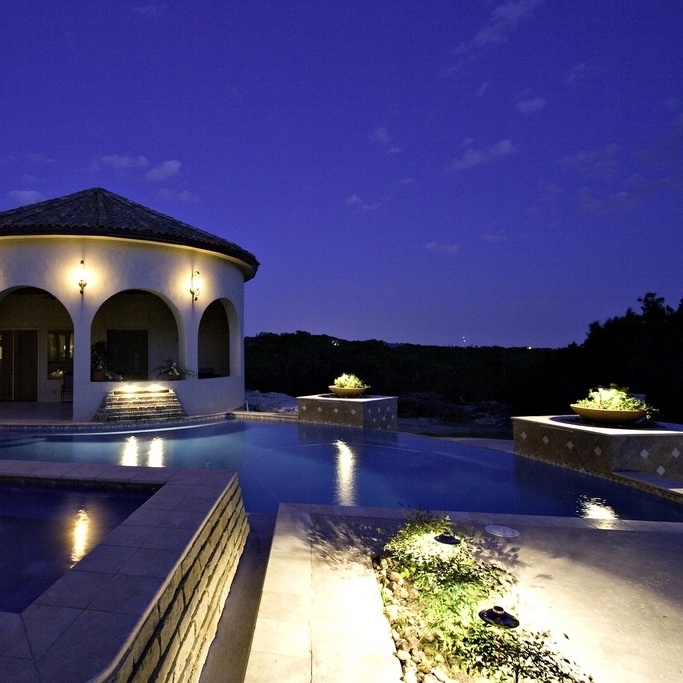 As we’ve mentioned before, different types of outdoor lighting achieve a variety of results. It’s possible to use these lights, even those meant for another use, to aid security lighting. For example, low-level lighting is a safety feature. Whether you line your driveway, walkways, or porch, low-level lighting will provide safe passage. String lights are enjoying a surge in popularity for their ambiance. The use of LED lighting, notably LED lighting strips, has exploded in the outdoor lighting industry. All of these light options will enhance your security lighting. Other types of lighting enhance security lighting options. There are many types and styles of security lighting. Many homeowners are revamping their security systems and lighting since newer technology provides better options than when they bought their home. The important thing is to choose an option that works well for your situation, whether you integrate additional pieces with existing hardware, or upgrade the entire system.